When thinking about how to reduce their energy consumption this winter, most people in Columbus think about upgrading their heating system. While improving the heating system that you have can potentially reduce the amount of energy that you use, once that heat is inside your home it’s up to the insulation to take care of it. In this blog post, we’re going to discuss what insulation does, how it’s rated and why you might want to think about replacing your insulation. Long ago, insulation consisted of shredded paper or textile that was placed in between the walls and ceiling of people’s homes. As technology developed, insulation became more advanced and more efficient. Now, we give insulation an efficiency rating that is called at R value. The R value describes a material’s thermal resistance, that is, how resistant it is to absorbing heat. The higher the R value, the more heat resistant the material is. Rolls and Batts – This is typically used in homes. It is the pink or yellow rolls that you’ve probably seen before. If your walls and ceilings were constructed using 2 x 4 wood beams, the insulation likely has an R value between 13 and 15. Rigid foam – This is typically used to insulate exterior walls but can be used on interior walls as well. It is typically more expensive than rolls and batts and has an R value of 4 or 5 per inch of thickness which is about double that of comparable materials of the same thickness. Foam-in-place – This type of insulation is blown into the spaces between ceiling and walls joists. It expands and fills the space. This type of insulation can have R values between 3 and 7 depending on the type that you get. Over time, everything breaks down. This is true for your insulation as well. The insulation in your home is your last stand at keeping the heat that your heating system produced. Upgrading your insulation is absolutely one of the best things that you can do to increase the efficiency of your home. In particular, the insulation that is in your ceiling is especially important. As the heat in your home rises, it tries to seep through into your attic and outside. Go up to your attic and look at the insulation that is lining the floor of it. If you notice that it is thin, or if there are gaps between the ceiling joists, it means that you are wasting heat energy through those areas. Upgrading your insulation is a great way to cut back on energy consumption and keep your home comfortable this winter. 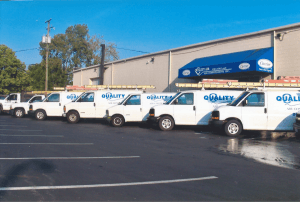 If you think that you need to have the insulation in your Columbus home replaced, call the heating experts at Quality Air Heating and Air Conditioning. We take pride in making sure that each of our customers is as comfortable as possible all year long. Give us a call today!